Hey Siri, can you be my workout DJ? I stream a lot: Music, movies, podcasts. My DVD collection, which I honestly once believed I'd build out forever, now stands as a dusty memorial to my own naivety. I keep a lot of vinyls around because I like the artwork and I still value albums "as a whole", but CDs have lost their shine. And as I subscribe to streaming services, I'm rarely compelled to buy and download music online. So when I go out running and want to listen to music (which is always, because only sociopaths run without music. And Liam Gallagher), my phone invariably comes too. These days a lot of smartwatches and fitness trackers come with a few GB for storing offline music, and that's great for people who can make use of it, but my offline library is dismal, and unless I'm using a Samsung watch, offline Spotify is but a dream. 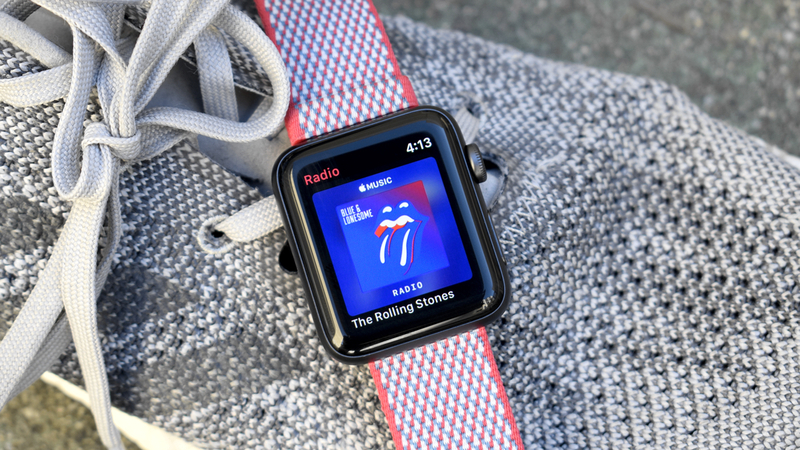 Apple already lets you sync music to the watch, but it's about to let you stream music from either Apple Music or iCloud music library sans iPhone on the go, taking advantage of the Series 3's new LTE connection. Apple let me try an early preview of the new service, which it says will roll out publicly "later this month". It boasts around 40 million tracks on its music streaming service, but you'll also have access to its radio stations on the go through the new Radio Watch app. It's a shame this all wasn't ready in time for the launch of the Series 3, but now it's here the Apple Watch feels more like the standalone fitness companion it promised to be. Here's how - and how well - it works. It probably goes without saying, but you'll need an Apple Music subscription to stream music on the Watch; don't expect Spotify to make its way on any time soon. Of course you can already play songs sync'd from your iTunes library - they're not going anywhere - and the basic app is largely unchanged in how it looks. You will, however, see a new Radio app on the list, which I'll come to. With streaming music on the Watch, Siri takes center stage. You can start a radio station or load a saved playlist with just your fingers, but if you want to listen to a specific song, artist or genre on demand, Apple's personal assistant holds the key. The phone app lets you browse artists, genres and playlists, but obviously the Watch's smaller screen doesn't so easily allow for that (Apple's got this far without sticking an on-screen keyboard on the Watch, and I expect it'll stay that way). Apple Music playlists that you've saved offline will appear in the Music app, but they can also be pulled up and streamed by asking Siri - for example, "Hey Siri, play Wham essential playlist". When playing from a playlist you'll see a small icon you can tap to show you the entire list of songs to choose from, something you can't do when playing from a station or artist. You don't have to be too specific when asking Siri to play something; you can ask "Hey Siri, play new music", "Play workout music" or "Shuffle my running playlist". You can also request specific songs or artists, like "Hey Siri, play Chelsea Wolfe" or "Play Reptilia". The watch app shares a few other features with the phone app, including a button to add music to your library (which you'll see when you next open the app on your phone) and the star icon that lets you select either "Play more like this" or "Play less like this". And of course, you can start radio stations too like Beats 1 or NPR, but these can be done through the new Radio app, not just Siri. Apple thinks you'll do most of your music streaming when working out, so the best way to test it was to do exactly that, just me and the Apple Watch. Being able to leave the house with just the watch and maybe my keys feels both strange and liberating, and it's something I've not done a lot since initially reviewing the Series 3 because I prefer to stream. But my first concern was leaning on Siri. For all its improvements - and it did get faster with the Series 3 thanks to the new processor - Apple's personal assistant still makes plenty of mistakes, so I was skeptical about its DJing proficiency, but thankfully it's been pretty good so far. You can either speaking into the watch itself or through any connected Bluetooth headphones with Siri support: just say what you want to listen to and - assuming your connection is solid - it'll start playing. There's a couple of seconds as Siri processes the initial request, and then one, maybe two more as it loads and starts buffering the song, before it starts. That's assuming a) the watch's cellular connection is good and b) Siri gets it first time, which won't always happen. Occasionally Siri misheard my request, but I'd say 80% of the time it landed. Siri also self-corrects, and that includes picking out homophones: one read-out showed a request for "Play Run The Jules" but it knew what I meant. Siri does come unstuck when that cellular connection drops, though, as tends to happen when using him/her through the phone. Obviously this is more the fault of the carrier, but when Siri trips on a slow connection he/she can be much more frustrating than simply tapping on a song that won't buffer. Sometimes I've found it just hangs, or stutters as it attempts to listen to my increasingly aggravated voice, which can be especially irritating in the middle of a workout when you really don't want to stop. On a couple of occasions it registered my request and then just carried on as if nothing had happened; I couldn't tell if it was being slow or Siri had forgotten what I asked. If you stream in a place where network coverage is good then this problem should't rear its head very often. More concerning for me is battery life; after a 45 minute run using GPS and streaming music the whole way, I'd drunk 25% of the battery. On a different, much more humid day it seemed to deplete a little faster than that, and I found the watch getting quite warm on my wrist. Apple told me it expects users will still get all-day battery life when mixing in a workout with more general use, and I've found that to be the case in testing, but if you're planning a two-hour run then you might discover you don't make it to dusk, depending on how much you hammer it for the rest of the day. While it's not going to burn the battery any near as fast as taking a call (you'll only get an hour of continuous talk time on the Apple Watch Series 3), I'd recommend checking the battery before taking it out, else risk getting a flat one. The music update makes the Apple Watch Series 3 feel more complete as a standalone device, especially when it comes to fitness. Owners of older Apple Watch models will get some benefits from the new apps, but this is a real seller for the additional LTE connection which better justifies the Series 3 as a standalone device. The Series 3 isn't meant for totally ditching the iPhone, but those occasional moments of the day where you can be without your phone without losing a connection. With music streaming, some of those moments become even more freeing.